Head of the Binyamin Regional Council, Avi Roeh, was moved yesterday, Wednesday, when the first temporary dwellings of Amichai arrived. Yesterday, new caravillas were assembled in the new town of “Amichai” built for the residents of Amona in Binyamin who were evicted from their homes close to a year ago. Most Amona families have been living in one-room facilities in a school dormitory in the town of Ofra since the demolition. The residents are expected to enter the houses in about three weeks, and construction of the permanent homes will begin. Amichai was established on a hill in the eastern part of the Shilo bloc between the communities of Shvut Rachel and Adi Ad. "It's a festive day,” Roeh said. 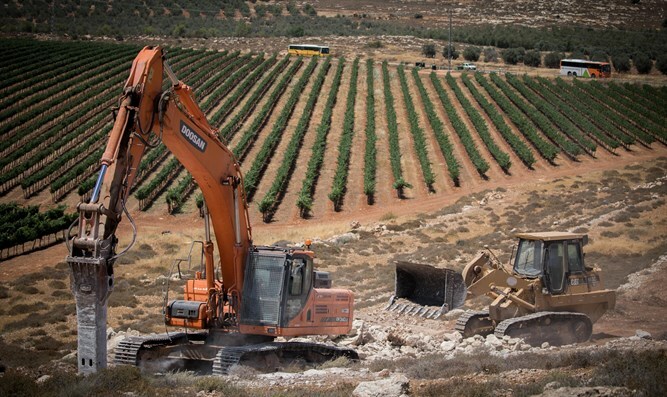 “We are experiencing something you don’t see every day, putting up buildings in daylight on a barren hill that is the location of the new community of Amichai," he said. The structures will serve the families, which should be moving here by Passover,” he told Arutz Sheva. According to Roeh, there is also some sadness involved in the struggle that led to the evacuation of Amona. "Every struggle causes us discomfort and pain in realizing that the country's leaders do not do the things that need to be done right away, according our understanding of how they should be." Roeh argues that the current political situation can enable Israel to take significant steps toward sovereignty. "This is a benificent period and we, as the State of Israel, must take advantage of this, including declaring sovereignty over the Jewish communities in Judea and Samaria.